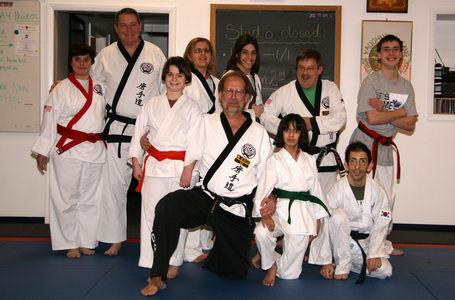 Special Dragons students at Vaughn’s Dojang are trained by World Tang Soo Do Association certified martial arts instructors in an exciting and supportive environment with a program designed for children and adults of all abilities. Parents, teachers, counselors, and therapists are consulted to enhance the students training program. Self-respect and respect of others are an integral part of this program. Tang Soo Do students are taught skills which encourage discipline and urge them to reach their maximum potential. Classes begin with stretches and basic drills. Instructors work with each student to find their full physical potential. As each student develops, they are continually challenged to perform their best while having fun. Hand-to-eye coordination is emphasized using various techniques such as games, balloons, and staffs. Students are mentally challenged to their maximum potential as they learn Korean terminology and the history of martial arts. Training equipment at the studio allows students varied exercise opportunities. As each student achieves the number of classes required, a belt promotion adds to the excitement. Special training games excite students and provide something for them to look forward to. Please contact Master Chuck Vaughn at 610-676-0691 to learn more about this exciting and enriching program, and to schedule a free complimentary class. The following persons have donated to the scholarship fund for the Special Dragons in memory of Marilois Bauer, the mother of David Bauer, E Dan. We would like to recognize their generous gifts here, and to extend our sincere thanks for their contributions to the Special Dragons program.